Got a product or brand you think the 100K+ knowledgeable, enthusiastic beauty fans who read this blog each month would love? 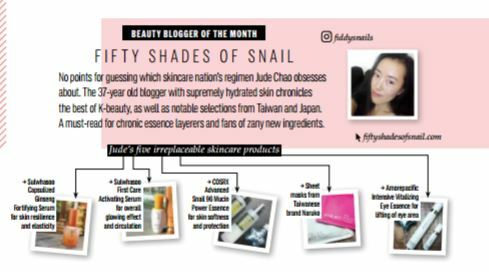 Fifty Shades of Snail readers and SNS subscribers are always on the hunt for skincare holy grails with solid ingredients and a sense of fun. I’m also happy to contribute quotes on K-beauty and skincare to interested media outlets–get in touch anytime! Working with Fifty Shades of Snail is like finding a new skincare product that’s not only shiny and has wonderful packaging, but becomes a product your skin falls in love with. Once you start using it, you can’t stop going back to it, because you have already established a beautiful relationship. Fiddy has been a delight to work with and has been extremely helpful in providing product reviews honestly, quickly and thoroughly. I am so happy to have had the opportunity to work with Fiddy and look forward to continuous collaborations in the future. To request more information or discuss a potential collaboration with Fiddy, use the form below.